A Baby's first Christmas is a really special time. You might have an 11 month old, walking around and ready for activity toys, or you may not have even had your baby yet but due before Christmas. Either way I am sure you are wondering what to buy. Our pram clips and rattles are all suitable from birth. They are ideal from around 6 weeks onwards and lots of customers have said their children loved playing with them until they were around 18 months old. These chunky peg puzzles are great for a first jigsaw, with pegs to help the development of gripping and bright pictures to keep them interested. Themes include Train, Dragon and Lion. 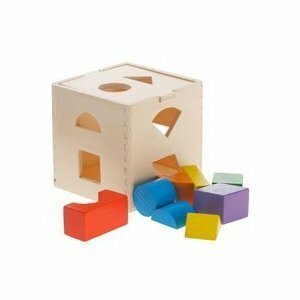 Tiny babies are entertained by interaction however as they get older toys will become more interesting and Shape Sorters are great for teaching children about problem solving and using precise movements. This toy may not be one for now but a great gift that can be used a few months down the line. The Tipper Truck also offers so many other ways to play. This is a great favourite and little minds up to the age of 2 love playing with this little worm. How does it wriggle and move? Natural wood offers sensory play and the bright colours provide interest. This toy can also be purchased as part of a stocking filler bundle and therefore comes with a FREE organza gift Bag.